Snorkeling is without a doubt one of the most breathtaking sports that anyone could take up. While many of us will never get the chance to see outer space, the world that awaits beneath the waves can be just as alien. There are countless strange sights and some truly incredible marine life just waiting to be discovered. If you’ve recently been bitten by the snorkeling bug and you’re looking to purchase your own mask, we can wholeheartedly recommend the Ocean Reef Aria full face snorkel mask. Keep reading to see our complete review to find out what makes it such a great choice. The Aria full-face snorkel mask is a fantastic choice for both novice and experienced snorkelers. It comes in a wide variety of options and price points (prices range from under $20 all the way up to about $200) that will suit just about everybody. What’s most impressive about the Aria is that even the entry-level budget-friendly options are incredibly high quality. We tested the cheapest available snorkel mask and we definitely came away impressed with it. And of course, as your budget goes up, the quality only increases even further. If you’ve ever gone snorkeling with a traditional mask and snorkel set, only to experience a mouthful of saltwater, then full-face snorkel masks like the Aria are perfect for you. As with all full-face snorkel masks, it’s designed to make breathing in the water feel as natural as possible. Best of all, it doesn’t matter whether this will be your very first snorkel mask or your fifth, you’ll find an option that will suit your needs. Just looking for a basic mask to test the waters for the first time? You can go with the entry-level option. Or are you an experienced snorkeler looking for something reliable that’s built to last? There’s an Aria for you as well. 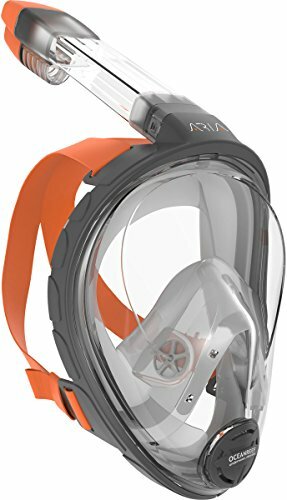 When you purchase the Aria full-face snorkel mask, you’ll find the mask itself along with the attached dry-top snorkel system in the package. The Ocean Reef Aria comes in a variety of sizing options that are designed to fit comfortably for everyone. On top of that, the Aria boasts the largest field of vision of any snorkel mask out there. You’ll be able to take full advantage of that impression field of vision as well thanks to the internal mask partition with fresh air venting that helps to prevent the mask from fogging up. The mask itself is made out of light and durable thermoplastic. If you feel like heading down beneath the water surface, the Aria has a built-in dry top snorkel system that works great for keeping water out of the snorkel. You’re free to just sit back and breathe comfortably through your nose. And in the instance that some water does manage to find its way into your mask, there’s even a self-purging valve at the bottom of the mask that will purge it for you. It’s important to note that when using full-face snorkel masks that there’s a risk of CO2buildup occurring within the mask. While many snorkel mask manufacturers are aware of this and have taken steps to minimize the risks, we understand that some readers may prefer to go with a more traditional mask and snorkel set. If that sounds like you, then we can strongly recommend the Phantom Aquatics Panoramic Scuba Mask and Snorkel Set. It’s an incredibly well-made set that offers some truly outstanding panoramic views. Even better, the snorkel itself comes equipped with a large exhaust and purge valve at the bottom that help to minimize the most common complaint with traditional snorkel sets – water getting into your mouth. While we’ve covered pretty much all of the features that make the Ocean Reef Aria such a great full-face snorkeling mask, one thing that we specifically haven’t mentioned until now is just how incredibly comfortable it is to wear. All the fancy extras in the world won’t mean anything if wearing your snorkel mask feels like torture. And in all honesty, that just might be one of the biggest selling points for this mask. There’s no shortage of full face masks that offer crystal clear views, anti-fog and anti-leak technology, and dry-top snorkel systems. But not many of those masks combine all of those great features while offering an exceptionally comfortable fit. The Aria combines comfort and functionality with ease, making it an incredibly easy snorkeling mask to recommend to absolutely anyone with even a passing interest in the hobby. It’s especially great for first timers. Simply put the mask on and hop in the water and within seconds you’ll be immersed in a breathtaking underwater world – all while breathing naturally and comfortably through your nose.